Tom Shippey Lecture at UWIC – all welcome! 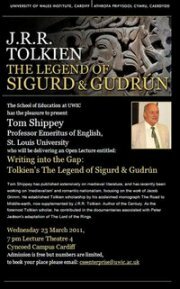 I am delighted to announce that the School of Education at UWIC will be hosting an Open Lecture by Tom Shippey entitled: “Writing into the Gap: Tolkien’s The Legend of Sigurd & Gudrún“ on Wednesday, 23rd March 20011, at 7pm, in Lecture Theatre 4 at our Cyncoed Campus, Cardiff. Professor Tom Shippey really needs no introduction to any Tolkien student. He is one of the most respected scholars internationally on medieval studies, and his work marked the beginning of serious academic study of J.R.R. Tolkien’s writings. His career followed in the footsteps of J.R.R. Tolkien as he taught at Oxford University at St. John’s College for seven years, overlapping with Tolkien’s last years of retirement, and then he was appointed Professor of English Language at the University of Leeds, where he inherited Tolkien’s chair and syllabus. He is the author of two of the most quoted books in Tolkien studies: The Road to Middle-earth and J.R.R. Tolkien: Author of the Century. It is a great honour to have him lecture at UWIC on the most recent Tolkien book published (for more information on The Legend of Sigurd & Gudrún see brief presentation and videos below – scroll down to 15th May 2009). I am personally very much looking forward to this lecture! This is an Open Lecture and admission is free, but due to the popularity of the speaker we have asked all who plan to attend to e-mail UWIC at cseenterprise@uwic.ac.uk and reserve a seat. You can find more information on this lecture here.